Kang, H. Y., Lee, W. H., Jang, S. S., and Kang, C. W. (2017). "Polyethylene glycol treatment of Han-ok round wood components to prevent surface checking," BioRes. 12(2), 4229-4238. The effect of polyethylene glycol (PEG) treatment was investigated relative to surface checks of red and Korean pine round wood for building Korean-style homes. The logs used for this study were impregnated with a solution of PEG-1000 for three weeks, and then they were dried to a moisture content of about 15% at the temperature of 120 °C within the drying time of 49 h. During the middle stage of drying, slight surface checks were found on red pine PEG-treated logs compared with severe surface checks on red pine control logs. 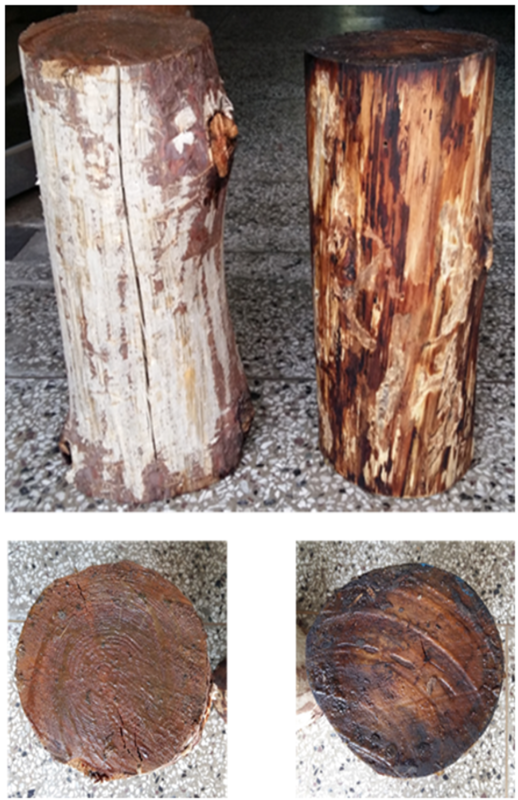 Due to PEG treatment and high drying temperature, at the end of drying, apparent surface check was not found on red pine PEG-treated logs compared with serious surface checks on the corresponding control log. No surface checks were discovered on Korean pine logs during and after drying due to the PEG effect. Thus, PEG treatment was effective in preventing surface checks on red and Korean pine logs during drying at high temperature. The major component of a Korean-style house (Han-ok) is round wood (boxed heart) with a diameter of over 20 cm. However, surface checks unavoidably occur during the conventional drying of these materials due to anisotropic shrinkage. The high-valued wood-crafted products manufactured using round wood have been slowly dried to prevent surface checks after being soaked for a long time in a solution of polyethylene glycol (PEG). This method is called the PEG drying method. Surface checks are prevented by the PEG drying method because shrinkage is inhibited by PEG penetration of the wood cell walls (Stamm 1959; Mackay 1972; Alma et al. 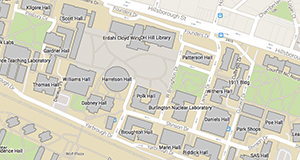 1996; Hoadley 2000; Jena and Gupta 2002). The hydroxyl groups of cellulose in the wood cell walls bond easily with the oxygen of ether groups in PEG as a water-bone nonionic surface active agent, resulting in the loss of water molecules (Ralph 2006). It is important to improve the penetration rate of PEG in order to prevent surface checks. There should be free water present in wood specimens, which initiates the mutual interchange between the free water and the solution of PEG. This results in the penetration of PEG because of its water solubility (Loughborough 1948). The penetration rate is affected by the specific gravity of wood (Ralph and Edwards 2004; Hong et al. 2013), and it increases with increasing temperature (Yamaguchi et al. 1999). Wood cell walls are penetrated faster with low molecular weight PEG than with high molecular weight PEG (Jeremic and Cooper 2009). Wallstrom and Lindberg (1995) reported that the weight of specimens was increased by 20%; however, only a slight amount of the low molecular weight PEG penetrated the specimens. Mueller and Steiner (2010) showed that PEG treatment reduces variation in wood color, especially, low molecular weight PEG. Hoadley (2000) found that the molecular weight of 1000 was most suitable for preventing surface checks in wood. Wood is a porous material with cylindrical pores in the longitudinal direction of the grain. In spite of the longitudinal pores, the permeability of wood is relatively low because most pores are not continuously connected. Wood permeability influences the wood drying rate and its drying defects, and the permeability is affected by variations in the wood structure. The aspirated pit formations in soft woods and tylosis formations in hardwoods interfere with air and liquid flows in wood. The rate of PEG treatment is related to the permeability of wood, which can be measured by using liquid or gas (Siau 1984). 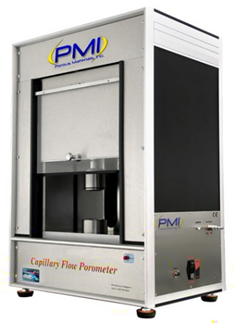 In this study the capillary flow porometer (CFP) (Fig. 1) developed by Porous Material Incorporated (Ithaca, USA) was used for obtaining the air permeability of wood. This method measures gas flow rates as the function of pressure difference as described in ASTM 316-03 (2011). The special design of the instrument permits measurement of very small flow rates through some of the dense electrodes. It is possible to test samples having a variety of shapes and sizes. Although there has been extensive research on the PEG treatment of wood, there is little known about PEG treatment of red and Korean pine round wood. Therefore, this study was conducted to investigate the effect of PEG treatment on surface checks on red and Korean pine round wood used for Korean-style house construction. In addition, the permeability in the longitudinal direction between red and Korean pines was compared, and the influence of permeability on the drying rate and defects were evaluated. where MC is the moisture content (%), Wg is the initial weight of wood (g), and Wod is the oven-dry weight of wood (g). Room temperature solid PEG-1000 was first melted at 60 °C. Liquid PEG was diluted in water at a 2:1 ratio. The logs had been fully immerged in the solution by top-loading dummy boards for three weeks. After impregnation, the logs were dried under at 120 °C for 49 h, including the one-hour time for attaining the desired temperature, in a kiln drier. The air velocity through the specimen piles was about 3 m/s. During drying. one PEG-treated and one control log for each species were weighed regularly. After drying, a 5-cm thick wood disk was taken in the middle of each log and weighed. They were then oven-dried at 103±2 °C to calculate the final MC of the logs using Eq. 1. Gas flow rate was obtained by using the CFP. Before the CFP test, the specimens were saturated with distilled water after evacuating the chamber containing them. Water-saturated specimens were placed in the CFP chamber, which was tightly closed (Fig. 4). Nitrogen gas flowed in behind the specimen. The gas pressure and flow rate through the dry specimen were also measured. From these results, air permeability of wood specimens was estimated. The maximum air pressure adopted by CFP was about 0.7 MPa. where, k is the gas permeability (m3/m), Q is the volumetric gas flow rate (cm3/s), L is the longitudinal length of the specimen (cm), η is the viscosity of the gas (mPa·s), A is the cross-sectional area of the specimen (cm2), and ΔP is the pressure difference (1atm/cm). The longitudinal length of the specimens was the same as the thickness of beds, which was 10 cm long. The cross-sectional area was calculated from the photos of both ends of the specimen taken with a stereoscopic microscope (Dinolite AM-311S, Anmo Electronics Co., Taiwan Hsinchu) and a graphic software. Air permeability was obtained from the gas flow rates along the fiber direction of wood. The relationship between the gas flow rate as a function of pressure difference in the longitudinal directions of red and Korean pines is shown in Fig. 5. For both species, the gas permeabilities largely fluctuate below 0.1M Pa and level off above 0.2 MPa. The gas permeabilities of Korean pine specimens are much higher than those of red pine specimens by almost 50 to 100 times, which confirms that the former are much gas permeable than the latter. The gas permeabilities of two Korean pine specimens, KP1 and KP4, are extremely higher than the other Korean pine sapwood specimens, so that their plots are out of the graph. The reason of their abnormality is not revealed. To compare between sapwood and heartwood specimens, the gas permeabilities at 0.4MPa are depicted in Fig. 6. The last two specimens are taken from heartwood for both species. It is obvious that the gas permeabilties of heartwood specimens are lower than those of sapwood specimens for both species. It is hard to find any evidence that the gas permeability changes with age of the wood. Eliminating extraordinary high values of KP1 and KP4 specimens the average gas permeabilities are 0.360×10-13m3/m and 0.059 x10-13m3/m for sapwood and heartwood of red pine, respectively, and 21.10×10-13m3/m and 0.471×10-13m3/m for sapwood and heartwood of Korean pine, respectively. Referring to published gas permeability data (Siau 1984), Korean pine sapwood is similar to Douglas-fir sapwood (Pacific coast) while red pine sapwood and Korean pine heartwood is similar to Douglas-fir heartwood (Pacific coast). The least gas permeable Korean pine heartwood is similar to cedar heartwood. The gas permeability difference between species influences the depth of PEG impregnation, drying rate, and drying defects of the specimens. 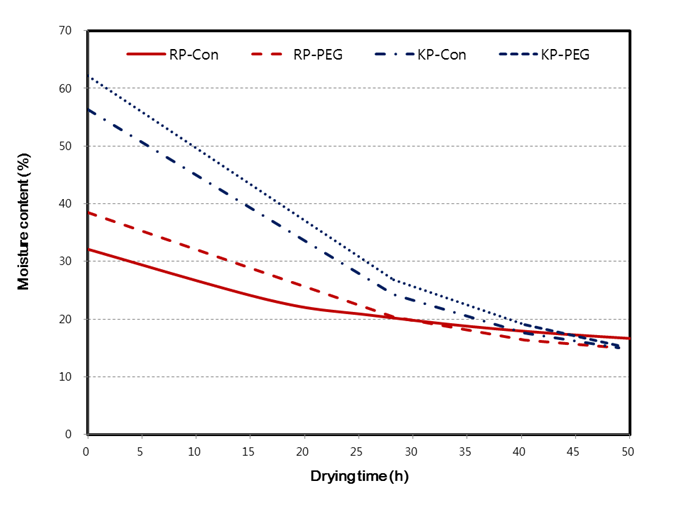 The MC of red and Korean pine logs as a function of drying time is presented in Fig. 7. The initial MCs of the treated and control samples of red and Korean pine specimens were approximately 38%, 32%, 62%, and 57%, respectively. Regardless of species, the MC of PEG treated logs was slightly higher than that of the control sample. It is natural that the PEG-treated logs absorbed water during impregnation. But it is interesting to notice that both control and PEG-treated logs reached the same final MC of about 15%. It implies that most of the PEG solution was exuded during drying. Whether PEG treated or not, Korean pine dries faster than red pine, which can be explained by the difference of gas permeability between species as described before. At the drying time of 20 h from the beginning of drying, several narrow and short surface checks were found on PEG-treated red pine logs, while large and long cracks were found on the controls. However, no surface checks were discovered on both PEG-treated and control Korean pine log. These observations can be accounted for by the effect of PEG on retraining shrinkage of sapwood, effect of high drying temperature on increasing tensile stresses on surface layer during the initial stage of drying, and much higher permeability of sapwood in Korean pine absorbing more solution of PEG etc. Therefore, PEG played an important part in retraining the surface checks. This was in agreement with the observations of other researchers (Stamm 1959; Mackay 1972; Alma et al. 1996; Hoadley 2000). After drying, serious surface cracks were present on a control red pine log, while visible checks were not found on a PEG-treated red pine log (Fig. 8). No checks were discovered on Korean pine logs after drying, which can be ascribed to the PEG effect. This indicates that PEG treatment is effective in preventing surface checks. 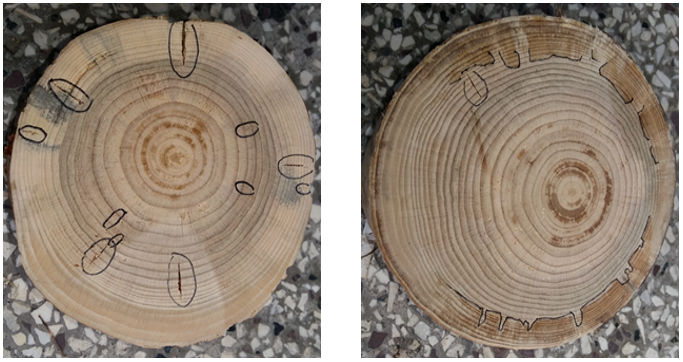 Internal cracks inside the red pine logs, observed after logs were cut at the middle position, and then at the end surfaces of logs were exposed to air for one week after drying had finished in order to fully release the viscoelastic strain, are shown in Fig. 9. Internal cracks developed inside both control and PEG-treated red pine logs. However internal checks in the PEG-treated logs did not extend to the sapwood compared with the control logs. This can be attributed to the PEG effect, which makes the shell layers of treated specimens stable dimensionally. This also proved the effect of PEG restraining shrinkage of sapwood. 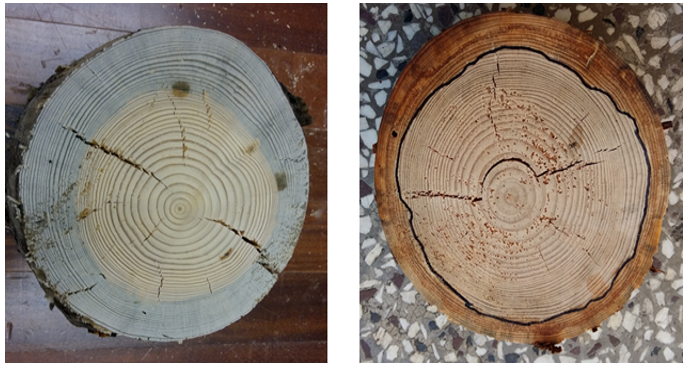 Internal cracks inside Korean pine log are presented in Fig. 10. 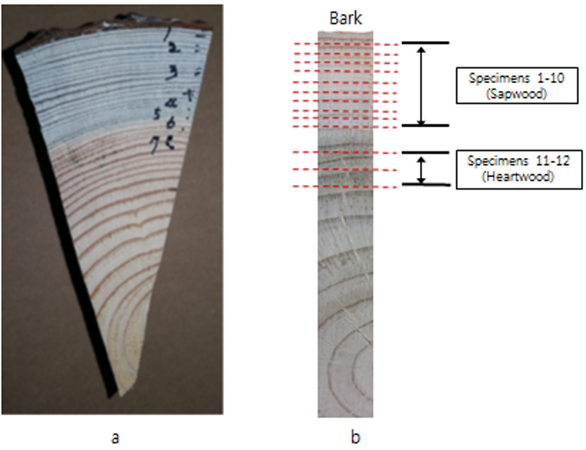 Many narrow cracks were found in both sapwood and heartwood of Korean pine control logs, while only one crack was discovered in Korean pine PEG-treated logs, which can be ascribed to the PEG effect. This indicates that the PEG treatment is effective in preventing both surface checks and internal cracks of Korean pine logs. 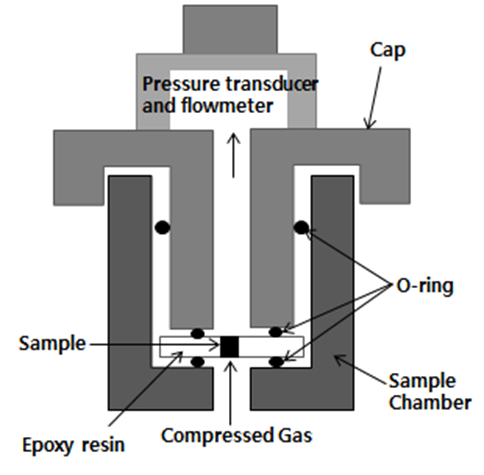 The gas permeabilities obtained by using a capillary flow porometer were 0.360×10-13m3/m and 0.059 x10-13m3/m for sapwood and heartwood of red pine, respectively, and 21.10×10-13m3/m and 0.471×10-13m3/m for sapwood and heartwood of Korean pine, respectively. Red and Korean pine round wood had been impregnated into the solution of PEG-1000 for three weeks, and then were dried to a MC of about 15% at the temperature of 120 °C during a drying time of 49 h. During the middle stage of drying, slight surface checks were found on red pine treated specimens compared to severe surface checks on red pine control specimens due to the PEG effect and high drying temperature. 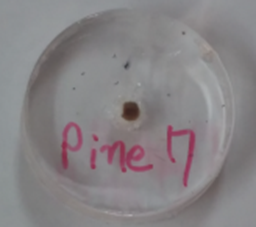 At the end of drying, an apparent check was not found on red pine treated specimens compared to serious surface checks on red pine controls due to the PEG effect. No surface checks were discovered on Korean pine specimens during and after drying due to the PEG effect. Thus, the PEG treatment was effective in preventing surface checks on red and Korean pine round woods during high drying temperature. This study was carried out with the support of ‘Forest Science & Technology Projects (Project No. S121414L060120)’ provided by Korea Forest Service. ASTM F316-03(2011). “Standard test methods for pore size characteristics of membrane filters by bubble point and mean flow pore test,” ASTM International, West Conshohocken, PA.
Hoadley, R. B. (2000). Understanding Wood. The Taunton Press, Inc., CT, USA, p. 288.
media,” Fluid/Particle Separation Journal 14(3), 227-241. Loughborough, W. K. (1948). Chemical Seasoning: Its Effectiveness and Present Status (Report D1721), U.S. Department of Agriculture, Forest Products Laboratory, Madison, WI, USA. Ralph, J. (2006). “PEG penetration and the effects of PEG pretreatment in air-dried Eucalyptus regnans,” Wood and Fiber Science 38(1), 139-143. Ralph, J., and Edwards, S. J. (2004). “PEG penetration in three commercially important Tasmanian Eucalyptus,” Wood and Fiber Science 36(4), 611-619. Siau, J.F. (1984). “Transport Processes in Wood,” Springer-Verlag, New York, 95-97. Stamm, A. J. (1959). “Effect of polyethylene glycol on the dimensional stabilization of wood,” Forest Products Journal 9(10), 375-381. Wallstrom, L., and Lindberg, K. A. H. (1995). “Wood surface stabilization with polyethyleneglycol, PEG,” Wood Science and Technology 29(2), 109-120. DOI:10.1007/BF00229340. Yamaguchi, T., Ishimaru, Y., and Urakami, H. (1999). “Effect of temperature on dimensional stability of wood with polyethylene glycol II: Temperature dependence of PEG adsorption and mechanical properties of treated wood,” Mokuzai Gakkaishi 45(6), 441-447. Article submitted: November 25, 2016; Peer review completed: February 26, 2017; Revised version received and accepted: April 18, 2017; Published: April 25, 2017.